For those wishing to obtain a higher level of Portuguese, PUC-Rio believes that the best way is to study on a course with experienced, specialist professors. RIO DE JANEIRO, BRAZIL – With less than three percent of Brazilians fluent in English and only five percent of the population able to speak any English at all, long-term visitors and foreigners residing in Rio may consider learning Portuguese useful. 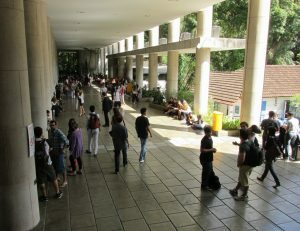 PUC-Rio is a sweeping campus set in the residential Gávea neighborhood, photo by CIEE. “One of the most important factors of our course are the academic excellence of the professors,” said Professor Adriana Alberquerque, PUC-Rio’s academic co-ordinator for the Portuguese for Foreigners course. According to Alberquerque, this is the principal reason that PUC-Rio’s Portuguese language course is different to others offered throughout the city. PUC-Rio offers foreigners the chance to study a range of levels of Portuguese language, ranging from absolute beginners to working proficiency through the two possible courses offered. The courses attract a diverse range of people, from undergraduate and post-graduate students to business professionals and long-term Rio residents. The first of these courses is for exchange students, organized through PUC-Rio’s International Cooperation Coordination and offering five language levels. The second offers three language levels and is organized through the university’s Extension Courses Coordination for independent students and residents in Brazil. Exchange students will submit a written exam to assess their level before arriving in Brazil, and will take an oral exam once they arrive. Independent students and residents will take both the written and oral exams in person in Rio de Janeiro. Programs last for one semester, or can be taken intensively during university breaks in January and February or July. Alberquerque says students usually report enjoying the courses offered immensely. “There are various factors that contribute to the construction of a group of positive aspects related to the Portuguese for Foreigners courses offered at PUC-Rio,” she told The Rio Times. “The location of the university in a safe and beautiful area [adds to the experience],” said Alberquerque, referring to PUC-Rio’s Gávea location, which provides a leafy, tranquil backdrop for students. The city of Rio has plenty of options for those looking to study Portuguese, but PUC-Rio stands alone in top academic credentials and campus facilities, providing an experience on par with top international universities around the globe. For the serious and committed student, it is the first choice. * This is a Sponsored Article by PUC-Rio.